When I went to Japan, I didn't really put together a proper wants list. In hindsight, I probably should have. I wasn't really prepared to be as overwhelmed by so much great, new music as I was. Even though I had built the trip up in my head for decades, it still over delivered once I was there. That being said, the one thing that I knew I wanted to pick up were the Ron Ron Clou full lengths. I wasn't able to find their first two, but Kazu from Waterslide pulled Good Melodies out of an LP bin at Record Shop Base for me. 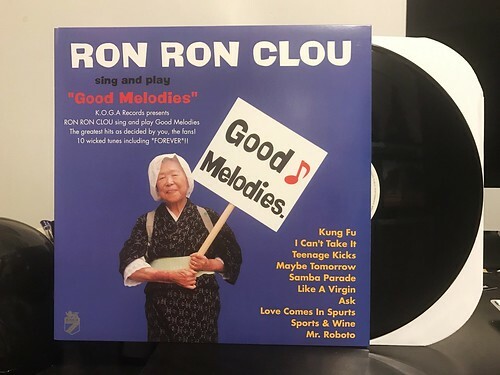 This certainly doesn't take the place of the two actual Ron Ron Clou full lengths, but it's a nice addition to the collection and I was very excited to have at least found one of their albums while in Japan. Last week I actually found a US seller on Discogs that had the other two Ron Ron Clou records for sale at a pretty good price. I bought them and they're actually in the mail heading my way now, so expect those reviews in the upcoming weeks.